AMMONNEWS - FIFA president Gianni Infantino has said his controversial plan to expand the FIFA Club World Cup can play a key role in further developing the club game in Asia despite European opposition. Infantino’s desire to expand the tournament from seven teams to 24 when it is relaunched in 2021 has been opposed by the European Club Association (ECA), which has issued a boycott threat. 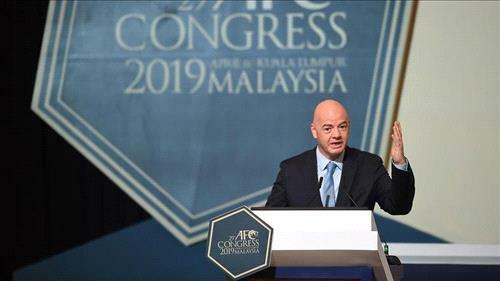 But the Swiss administrator told the Asian Football Confederation’s annual congress on Saturday that the expansion can help further improve the club game in the 47-member regional body. “We have been speaking again about how we can improve them and make them better and we have been deciding at the last FIFA Council to give birth to a new FIFA Club World Cup with 24 teams, including three Asian teams,” Infantino said in his address to delegates. The reconfigured Club World Cup, which would be played once every four years, would feature eight clubs from Europe, six from South America as well as three each from Asia, Africa and CONCACAF - which covers North and Central America nations plus those in the Caribbean - and one from Oceania. Asian clubs have featured in the tournament since it was created in 2000, with two clubs from the continent - Kashima Antlers from Japan in 2016 and Al Ain of the United Arab Emirates last year - reaching the final. Both lost to Spanish giants Real Madrid. Infantino also reiterated his desire to further investigate expanding the 2022 World Cup finals to 48 teams and asking current hosts Qatar to share the tournament with neighboring nations. “Sharing a few games with a few of the neighboring countries is, of course, an option as well to make it a true World Cup for the world and for the whole Gulf region,” he added.